I hosted my morning show live from Colonial Williamsburg, Virginia, to commemorate the 4th of July Independence Day holiday. Ghosts may or may not exist, but “edu-tainment” is a very real buzz word in the tourism and hospitality business as time-crunched students, parents and retirees demand more earthly rewards from their destinations. 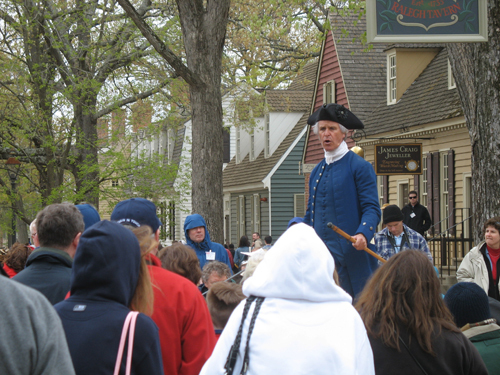 Colonial Williamsburg, Virginia, including Jamestown and Yorktown, may very well be haunted with Revolutionary War era spirits – but it is bursting with fun and full of spirited, costumed character actors who perform the roles of colonists and soldiers. The town’s historic and recreated buildings create what feels like a movie set for those characters and the authentic scene makes for a perfect blend of learning and entertainment for all ages: an experience scored with musket rifle and cannon fire, fife, drum and bugle corps music, and the clip-clopping horse hooves. You can even rent your own period costumes and get into the act! *The Jamestown Settlement pre-dated the Pilgrims and may have actually staged the first Thanksgiving. *Yorktown was the site of the final decisive battle of the Revolutionary War. *George Washington did not have wooden teeth, but rather, rhinoceros teeth wired into his mouth. Each of these tidbits I learned without trying. This gossip on Washington was whispered to me by “Christiana Campbell,” the woman who operating the tavern in which Washington dined more than 90 times. (We had the crab cakes, fricassee, and skillet cornbread – all favorites of “General Washington.”) Reservations are recommended for any of the authentic taverns which feature similar edu-tainment and music, with gourmet period entrees for about $22. 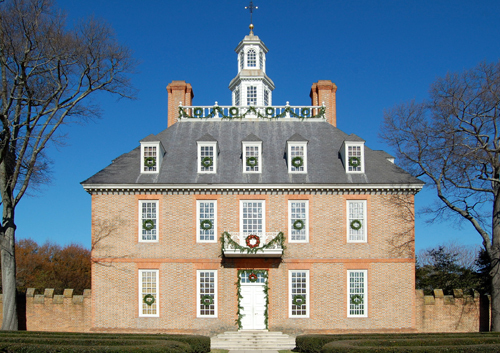 All of the historic attractions, including the charming shopping and dining in Merchants Square adjacent to the College of William & Mary at the foot of the Duke of Gloucester Road (Colonial Williamsburg’s main drag) are reachable on foot from the Williamsburg Lodge (on the National Register of Historic Places) and the Williamsburg Inn, where Her Majesty Queen Elizabeth (yes, the real one) lodged recently when visiting to commemorate the 300th anniversary of Jamestown (well before the British lost control.) Choosing one of these two hotels is like sleeping in the middle of Greenfield Village (just ask Williamsburg spokeswoman Linda Stanier, who once lived in the Dearborn area), but the area also offers varied lodging options adjacent to the action or within minutes by car and shuttle. The Hampton Inns and Howard Johnsons of the area are built of brick in order to blend in! A pleasant, tree-lined drive from the sparkling, easy Richmond International Airport is part of what makes Williamsburg convenient, pleasant and fun. While Washington, Thomas Jefferson and the like came to the New World long before golf, Robert Trent Jones brought golf to Williamsburg in the 1960’s by creating the tumbling, dramatic Golden Horseshoe Golf Club right behind the Williamsburg Inn and the Lodge. The Colonial-style clubhouse and courses (RTJ’s son Rees added a second course in the 1980’s) fit appropriately into the low-rise landscape and are both charming and big time at the same time. After your round, enjoy a swim in one of the two outdoor pools or enjoy an old-fashioned game of checkers on the club’s veranda. For faster-paced lollygagging, Busch Gardens amusement park is three miles up the road next to the famed Kingsmill Resort and Spa. Anheuser Busch operates both as well as a world class water park called Water Country USA. 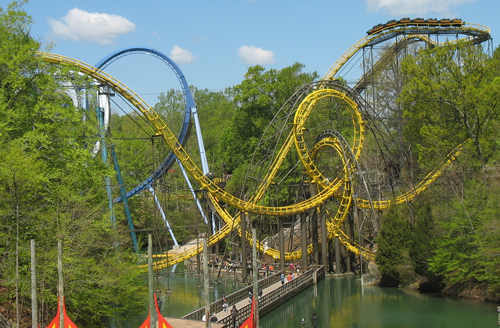 Busch Gardens, blended into the trees along both sides of a lush river valley features animal acts, including the Budweiser Clydesdales, musical shows, including Irish dance, thrill rides, including kiddie rides and gentle turns for all ages. The park is divided into sections representing Ireland, Italy, France, Germany, Scotland, and England – each section offers creatively themed rides, shows and cuisine. This is no carnival – it is pleasant and clean. Kingsmill Resort and Spa features tennis and three golf courses. The Pete Dye-designed River Course has hosted the PGA TOUR and continues to serve as venue for an LPGA event – Christie Kerr won at Kingsmill in May. Only Anheuser Busch products, including Bud and Michelob, are served in the clubhouse, which displays classic Budweiser memorabilia. Water Country USA, like Busch Gardens, is thoughtful, tasteful and fun, its water slides woven through the trees and into the hillsides. There are crafty themes and high-tech water slides the entire family can enjoy together (imagine a giant round raft with five people in it rocketing down a splashy side), plus a wave pool, dive show and lazy river. 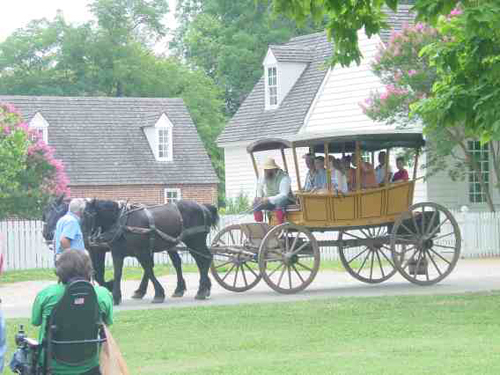 The ability to constantly and conveniently blend the fun with learning makes Williamsburg a unique, extremely diverse family vacation – a relaxed, simple, quality experience worth driving or flying to in order to create some of your own memorable history.